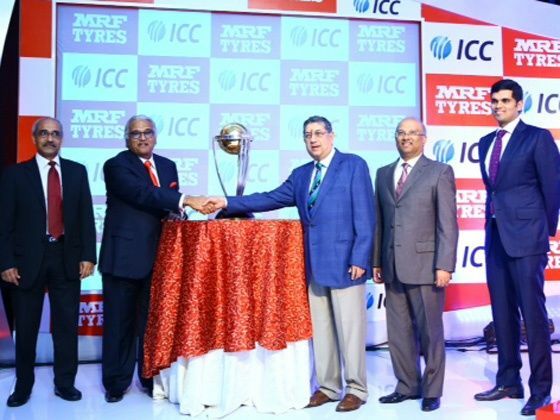 Popular Indian tyre manufacturer, MRF Limited has announced its association as the global partner for ICC Cricket World Cup 2015, as one of the main sponsors. During the ceremony the attendees also got a glimpse of the ICC Cricket World Cup Trophy which was unveiled at the event. With this association, MRF will have access to multiple branding opportunities at all game venues during the Cricket World Cup and at other promotional events held by the ICC across the world. The automotive tyre manufacturer has been associated to crickets for close to three decades, including the MRF Pace Foundation academy which has produced some of the best fast bowlers in world cricket. Currently, Virat Kohli, Shikar Dhawan, Gautam Gambir and Sanju Samson are MRF brand ambassadors. The ICC Cricket World Cup 2015 will start on February 14, 2015 and a total of 49 matches will be played across 14 venues, seven in New Zealand and the rest in Australia. Apart from the 10 full members, four qualifiers – Afghanistan, Ireland, Scotland and the United Arab Emirates, will also take part in the tournament. Petrol Power For Brezza, Finally. Diesel To Get The Boot! Honda CBR1000RR To Get Wings?